Please contact us by email if you would like to purchase this book. The Gerlach Barklow Company was organized in 1907. The construction of the factory building in Joliet, Illinois began in 1907 and was completed that same year. The prime movers in the organization of the company were Theodore R. Gerlach, Edward J. Barklow and K. H. Gerlach. All three men were former employees of a large calendar company in Iowa. Over the next decade, the company quickly grew into one of the largest calendar and advertising companies in America. The company management had an excellent relationship with it’s employees, sponsoring many sports teams as well as an annual picnic. The calendar images produced by Gerlach Barklow Company were known for their quality and are very sought after by illustration art collectors today. The Gerlach Barklow Company was a leading employer in Joliet, Illinois for several decades. 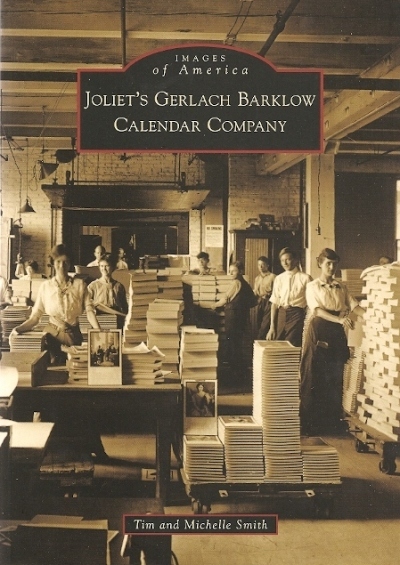 This book, through vintage photographs and calendar prints, offers a unique view of the Gerlach Barklow Company’s rich history. It includes calendar prints from the many artists employed by Gerlach Barklow, photos of the various departments that made up the factory, photos of company sponsored sports teams, Volland books, as well as examples of Rustcraft greeting cards. Tim and Michelle Smith are passionate collectors of original illustration paintings and calendar prints. They have given several presentations on the calendar company and its artists. Tim has coauthored collector guidebooks on Adelaide Hiebel and Zula Kenyon, the two famous female artists from the Gerlach Barklow Company. The Smith’s have displayed their illustration art collection at the Joliet Area Historical Museum and are active members of the museum. They also authored the Postcard History Series book on Plainfield, Illinois.